San Diego City Council candidate Vivian Moreno announced Monday the endorsement of City Councilmember Georgette Gómez for District 8, which includes Barrio Logan, Otay Mesa and San Ysidro. 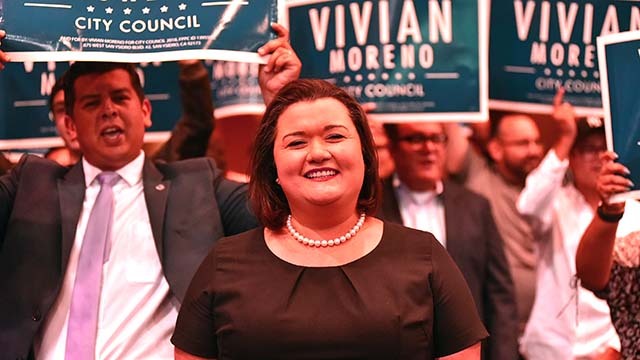 “I believe Vivian has the experience and vision needed to bring more change to city hall,” said Georgette Gómez, a first-term council member who is chair of the San Diego Metropolitan Transit System. Moreno, an aide to current District 8 Councilmember David Alvarez, who is termed out, is endorsed by him and San Diego’s Municipal Employees Association. In the June primary, Moreno received 35.9 percent of the vote to 27.5 percent for Antonio Martinez, who will face her in the November general election.